Mike Woodson, a disciple of Indiana’s Bob Knight, had just completed his first year as Atlanta’s coach. He preferred the glass-half-full outlook — even if only a couple of drops remained. “For the most part, our young guys are better,” he told reporters at a season-ending press conference. In a few short weeks, Boris Diaw would no longer be a part of that group. Diaw, 22, had just completed his second season and taken a major step back in the estimation of the organization. He was a unique player: an oversize point guard from France. The game was in his blood. His mother was one of France’s most renowned female players. A slender 6-foot-8, with a deceptively rangy athleticism, Diaw could do it all: score, pass, rebound, and defend. Everything Woodson needed. At its core, basketball revolves around one thing: scoring. And Woodson wanted Diaw to score more. But Diaw was no Allen Iverson. He hated to shoot, let alone dominate. He declined Woodson’s request, a defiance that has caused coaches to both celebrate and curse Diaw over the last decade. Diaw wants basketball to be democratic, a communal game. He wants to see the ball whipped around the court and shared. A good shot should never be settled for when a great shot could be had. “The way we play over there, it’s everybody touching the ball, and you try to be unselfish, be a good teammate, play for your teammates, try to get everybody to have fun,” Diaw said of playing in France. Diaw and Tony Parker once had it all mapped out. When they were boys, they’d talk about their future in the NBA, the unlikely duo from France, playing against the best, in the style they wanted to play. Rhythmic, unselfish, flowing. But Diaw’s dream was dashed in Atlanta, where Woodson employed heavy isolation sets and the ball stagnated. It’s a great system when you have a transcendent scorer and leader to whom teammates will defer. It’s not so pretty when Al Harrington or Antoine Walker are jacking up jumpers to their hearts’ content. Diaw’s game suffered. Parker called almost every day to console his friend. After Atlanta’s season mercifully ended, Woodson asked Diaw during his exit interview to come back the next season with a scorer’s mentality. “I cannot play for you,” Diaw simply responded. His offseason — one that would eventually alter his NBA future and help lead him all the way to San Antonio, where he won a championship on Sunday — had started. But his friend Parker’s had not. Diaw would soon plant himself in the stands at the 2005 NBA Finals, watching Parker capture his second NBA championship when the Spurs dethroned the Detroit Pistons. Diaw was happy for Parker, despite his own predicament. Everything had arrived so quickly for Parker. But quick and easy are two different things. Tony Parker Sr. grew up in Chicago, playing in games where “if you don’t have enough game to be out there, you won’t be,” he said. “You’ll be sitting on the side watching.” He was a 6-5 guard and played at Loyola-Chicago before moving overseas in 1977 to start his professional career. In Europe, he married a former tennis champion and Dutch model, Pamela Firestone. The couple had three sons. Tony, the eldest, was born in Belgium. He was followed by T.J. and Pierre. Tony Jr. was always full of energy. He wrestled with a dog and was bitten in the cheek at the age of 3. He tumbled down a set of stairs the next year and was left with a scar between his eyebrows. He was small. He was skinny. But he was quick and used his diminutiveness to his advantage. He loved to score and enjoyed the challenge of darting and skirting past bigger players. “I was very small growing up,” Parker said. “I was never tall, so that was the only way for me to get some buckets — to get the teardrop and create contact and different angles to try to go to the basket.” The brothers played basketball video games when they weren’t playing the game outside. 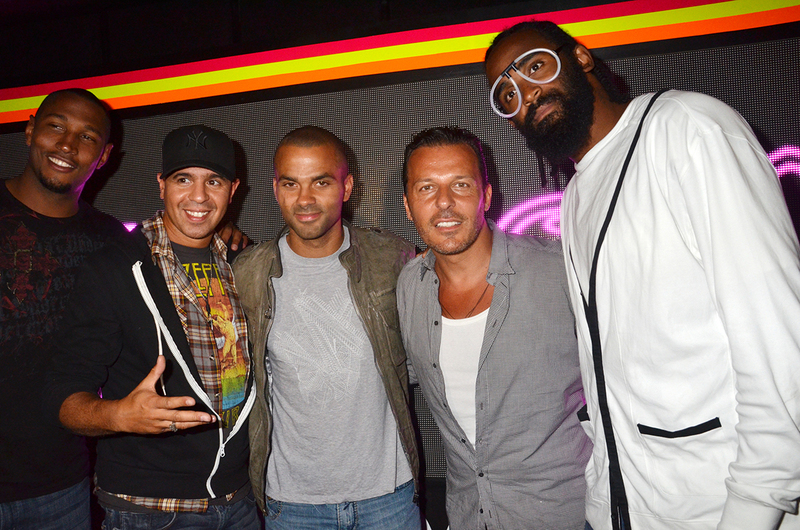 “I’ll be there one day,” Tony Parker would casually announce whenever they played NBA Live. While Jordan had entranced Parker, Diaw idolized Magic Johnson. He was already tall — about 6-5 when Parker met him — but he had point guard aspirations, too. “He was so unselfish,” Parker said. “It’s contagious, ’cause then the whole team wants to pass the ball. He didn’t care about stats. He always thinks about the team, what’s good for the team, before himself.” Diaw was the offense’s fulcrum, getting the ball to where it needed to be, setting screens, crashing the boards, and dunking. “I used to throw alley-oops all the time to him; he was super-athletic,” Parker said. Parker Sr. gave his son the option to continue his basketball education in America, but Parker had decided he was comfortable in France, playing against older players. “We talked about him going to Oak Hill Academy, but he decided he wanted to stay at INSEP,” Parker Sr. said. Parker became a professional and signed with Paris Basket Racing in 1999. France captured the under-18 European championship against favored Croatia the next year. When Parker fouled out of the game, his teammates rallied in his absence. Diaw blocked a shot. Turiaf hit a layup to tie the game at the buzzer, and France prevailed in overtime. “I remember after I scored that layup, who was the first one to tackle me?” Turiaf said. “Tony Parker.” That summer, Parker played at the Nike Hoop Summit in Indianapolis. He dazzled with 20 points, seven assists, and four rebounds against future NBA players Darius Miles and Zach Randolph. “We almost had him at Georgia Tech or UCLA, but the NCAA wouldn’t allow him to have amateur status because he was already with a professional club at the age of 17,” Parker Sr. said. Instead, Parker returned to Paris and averaged 14.7 points and 5.6 assists for Basket Racing. One year later, he entered the NBA draft. Gregg Popovich refused to look at the video of Tony Parker. Why would he? A teenage point guard from France? This is who would help bridge the Spurs from one championship to another? Popovich, at the time, was both San Antonio’s coach and its general manager. He had guided the Spurs to a championship in the lockout-shortened season of 1999. But he knew that roster had a fast-approaching expiration date. Veterans manned that team, most notably David Robinson, along with Mario Elie, Sean Elliott, and Avery Johnson. Tim Duncan’s late-season injury prevented San Antonio from a repeat in 2000. The Lakers swept the Spurs in the following year’s Western Conference finals. Popovich was acutely aware the Spurs needed to retool around their other tower, the dominant Duncan. But he didn’t think Parker was the answer. Parker had already worked out for the Spurs, jet-lagged and tired after arriving from France. Popovich dismissed the workout and the player, labeling Parker soft and “just another little skinny guy.” R.C. Buford, Popovich’s assistant general manager, had watched Parker in Indianapolis. The Americans could not bottle him up. Buford asked Sam Presti, then a front-office intern, to compile a video of Parker’s highlights. After Buford’s insistence, Popovich finally relented and watched. Popovich gave Parker another shot, bringing him in for one workout — this one ended prematurely. This time, he’d seen enough. Popovich was convinced. San Antonio took Parker with the 28th selection overall, the last pick of the first round. By the fifth game of the season, a 19-year-old Parker had supplanted Antonio Daniels, San Antonio’s incumbent starter. He was the youngest point guard to start in the NBA since Magic Johnson did so for the Lakers in 1979. The decision wasn’t easy for Popovich. He grappled with burdening the young Parker with that much responsibility. If Popovich broke his spirit, Parker would likely wash out of the league. Parker posted 9.2 points and 4.3 assists as a rookie, becoming the third Frenchman to play in the NBA, behind Tariq Abdul-Wahad and Jerome Moiso. San Antonio fell to the Lakers in the conference semifinals that year, but the following season, Parker had arrived. He helped dethrone the three-time defending champion Lakers and outplayed New Jersey’s Jason Kidd for much of the NBA Finals. That didn’t prevent Popovich from wooing Kidd in free agency to supplant Parker. Kidd stayed in New Jersey and Parker continued on. Diaw soon joined him in the NBA. Diaw had averaged only 7 points, 5.2 rebounds, and 4.1 assists for Pau-Orthez, but was anointed MVP of the French League, a signal that the voting coaches and players valued a well-rounded game above all else. Diaw had seen enough of Parker and success to understand the fame and acclaim a hardworking international player could attain in the NBA. Parker’s problems would be minuscule compared with what Diaw encountered. Atlanta selected Diaw with the 21st-overall pick in 2003, just 11 days after Parker celebrated his first NBA title. Diaw played in 76 games his rookie season, averaging 4.5 points, 4.5 rebounds, and 2.4 assists. Atlanta finished 28-54 and replaced Stotts with Woodson. Diaw’s play stagnated like the ball in Woodson’s offense the following season. He needed out, and he knew it. Mike D’Antoni and the Suns modernized today’s NBA, reshaping it from its pound-it-in, isolation era into the frenetic, up-and-down pace that defines the league now. Phoenix jumped from 29 wins in 2003-2004 to 62 a season later, D’Antoni’s first full year as the Suns’ head coach. His roster included young and exciting fliers like Amar’e Stoudemire and Shawn Marion and a dynamic Steve Nash deftly guiding the team. Phoenix fell to San Antonio and Parker in five games in the Western Conference finals before making an unpopular decision during the offseason. Young and smooth-shooting Joe Johnson, a restricted free agent, would be too costly to retain. Raja Bell had played against Diaw in France. He hardly recognized the dispassionate player who trudged through his final months in Atlanta. “I knew what he did there and I saw how Atlanta kind of robbed him of his joy of the game,” said Bell, who joined Phoenix the same offseason as Diaw. Mike D’Antoni envisioned Diaw as Nash’s backup point guard, but Diaw was forced to become D’Antoni’s center when Stoudemire struggled with knee problems and Kurt Thomas went down with an injury. D’Antoni sometimes joked with the slender Diaw that he was the second-best center in his family — behind his mother. Buying in to D’Antoni’s system is crucial to its success. He wanted his offense to score before the defense even had a chance to position itself. Diaw was oil to Nash’s engine. They created chaos when taller, slower centers struggled to chase Diaw on the perimeter. “He had a little bit of what [Suns assistant] Phil Weber said was that c’est la vie attitude, which, maybe they thought he had too much of, but it also allowed him to be a little bit more compromising in terms of what his role was,” said Sports Illustrated’s Jack McCallum, who spent a season with the team writing his book :07 Seconds or Less. Diaw had finally found the right system and the right teammates. “I loved it when I got there,” Diaw said. “We were playing up-tempo, we were playing smart basketball, just moving the ball, smart players all around the court, and it was just reading each other, reading plays, sometimes backdoor, sometimes handoffs. We had great players to execute it and be able to adapt to whatever the defense would give us.” Diaw won the league’s Most Improved Player Award, averaging 13.3 points, 6.9 rebounds, and 6.2 assists. In reality, he had hardly transformed his game. It was his teammates who had changed. The Spurs won a franchise-best 63 games in 2006, but fell to Dallas in seven games in the conference semifinals. Parker attended the Western Conference finals, where he watched Diaw’s Suns attempt to topple Dallas. Diaw poured in 34 points in the series opener, a surprising contribution for a player who practically had “PASS FIRST” tattooed on his forehead. His turnaround 7-footer with a half second remaining sealed Phoenix’s 121-118 victory. But the Suns lost Bell to a calf injury in the game, and Dallas rallied and prevailed against Phoenix in six games before losing to Miami in the Finals. Against Dallas, Diaw followed his 34 points with games of 25, 20, 20, 16, and 30 points. Diaw seemed to finally have secured for himself what Parker had found immediately in the NBA: a creative system and a coach who knew how to use him. 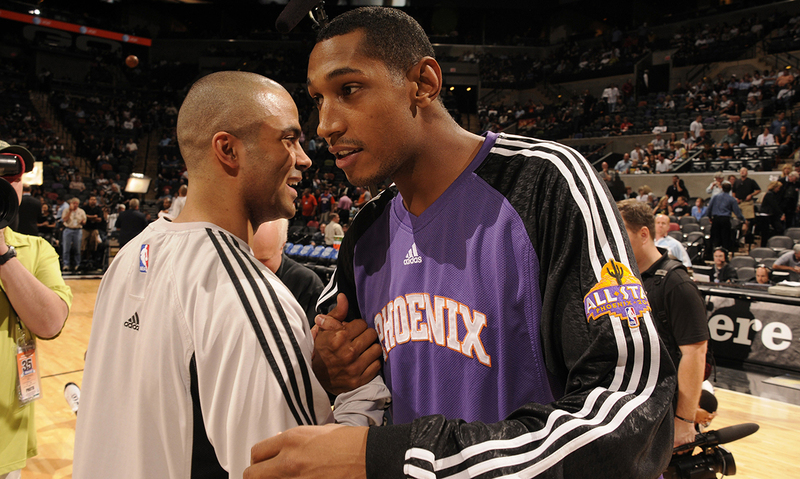 Diaw’s Suns and Parker’s Spurs met in a classic and heavily debated conference semifinal in 2007. Parker and Nash collided late in the series opener. The collision left Nash with a bloody nose that wouldn’t stop gushing. The game continued as Nash bled through the bandages and San Antonio won, 108-101. The teams traded wins the next two games. The Suns took a three-point lead late in the fourth game, when San Antonio’s Robert Horry hip-checked Nash into the scorer’s table. The Suns took a 104-98 win, but Diaw and Stoudemire had momentarily left the bench during the brief chaos that followed. NBA rules state that any player who leaves the bench during a melee is automatically suspended. Horry received two games, while Diaw and Stoudemire were barred for one game, a move that decimated Phoenix’s frontcourt. San Antonio closed out the series with two additional wins. San Antonio eventually defeated Cleveland and LeBron James in the Finals, securing Parker’s third title. The series and the suspensions essentially closed the window on the D’Antoni and Nash era in Phoenix. Newly hired general manager Steve Kerr traded for a past-his-prime Shaquille O’Neal the following season and sent Marion to Miami. Phoenix’s high-octane offense sputtered. The Suns failed to get out of the playoffs’ first round, leading to D’Antoni’s departure. Terry Porter had once been Parker’s mentor as a guard in San Antonio, and when he was hired to replace D’Antoni, he further tempered Phoenix’s offense. He once scolded Diaw for taking a bad shot, Bell said. “Boris took offense to it, so the next night we came out in Minnesota, Boris — in only the way Boris can do it — would work his way to the basket and get to within point-blank range and fire passes back out all night,” Bell said. “I don’t think he shot a field goal all night. I chuckled to myself, because I knew what was going on. It was hilarious. With Stoudemire healthy, Diaw’s playing time dwindled. In December 2008, Phoenix traded Diaw to Charlotte, along with Bell and Sean Singletary, for Jason Richardson, Jared Dudley, and a second-round pick. Charlotte improved to 44-38 the following year, its first winning season, and qualified for the playoffs. Diaw started every game, averaging 11.3 points, 5.2 rebounds, and 4 assists. Silas was a popular figure, having already coached the franchise from 1998 to 2003. As a player, he’d won two championships in Boston and one in Seattle. Charlotte regressed, finishing 34-48 in 2010-11. Jordan hired Rich Cho, formerly Portland’s general manager, and again remade the roster. The franchise traded Stephen Jackson over the summer and Gerald Wallace in the winter, its two leading scorers. Like Atlanta, Charlotte worked to accommodate Diaw. But the team found it difficult to trade an uninterested player. He was often listed as inactive and played in only four games in March 2012 before reaching a buyout with Charlotte that month. Parker, meanwhile, had become the Spurs’ premier option. They were a quality team each season, but had failed to reach the Finals since 2007. The Spurs claimed the Western Conference’s top seed in 2011, but lost in the first round to the Memphis Grizzlies. Parker’s spotlight had grown beyond basketball thanks to his marriage to and eventual divorce from actress Eva Longoria. Diaw considered his two most viable options. Mike Budenholzer said Diaw mostly impressed the coaching staff with his defense. “I don’t think until you are with Boris every day, battling in the playoffs and different matchups and different difficult situations, I don’t think people appreciate how good a defender Boris is, and how unique and versatile he is defensively,” Budenholzer said. San Antonio advanced to the 2012 Western Conference finals with Parker and Diaw finally united in the NBA. But while Parker already had his championships, it wasn’t yet Diaw’s time. Oklahoma City beat San Antonio in 2012. Then last year, Miami rallied in the NBA Finals against San Antonio. After two years bunking with Parker, Diaw finally left his home this season. But their lives are still deely entwined. And they’re hugely supportive of each other. Each regards the other as the better passer. “Obviously, I’m a point guard and I’ll pass the ball and try to do both, but Boris, I’ll give him that,” Parker said. “Yeah, he’s just a nice guy,” Diaw replied. A nagging sore ankle relegated Tony Parker to the bench in Game 6 of this year’s Western Conference finals against the Oklahoma City Thunder. Diaw, as he had done when they played with France’s junior team, rallied in Parker’s absence. He had 26 points on 8-of-14 shooting in the win, which would send San Antonio to the Finals for a rematch against Miami. He took the open shot, luring smaller defenders into the post and drawing bigger ones to the perimeter. He also spent much of the game defending Kevin Durant. Somehow, with his playing time increased and his role amplified, he was always a step or two ahead of the play. It’s innate to him. The scoring output shocked some of the coaches at Diaw’s previous stops. The Spurs were a better team this season, but made few changes to the roster. San Antonio lost Gary Neal, a factor in last year’s Finals. They benefited internally from the improvements of Finals MVP Kawhi Leonard and Patty Mills. But Diaw’s comfort level in Popovich’s system may have been the biggest game-changer. The series between Miami and San Antonio shifted when Popovich inserted Diaw into his starting lineup before Game 3. Diaw averaged 35 minutes a game in the Finals, up more than 10 minutes over his regular-season numbers. His presence bedeviled the Heat throughout. Diaw’s 43 total rebounds trailed only Tim Duncan’s 50. His 29 assists were the most of any player in the five-game series. Last summer, Parker and Diaw accomplished one long-term goal: winning gold at the EuroBasket Tournament. Lithuania concentrated on stopping Parker in the final game, limiting him to 12 points, but Diaw’s 15 points, six rebounds, and four assists carried the team. “My only wish now is for Boris to win a championship because I was lucky enough to win three championships,” Parker said before the Finals. “We made our dream last year, winning with the national team, winning the first title for our country. And now I’d love for him to experience it at the NBA level.” Two weeks later, he has. “We’re a true team, and everybody contributes,” Parker said after Miami’s 104-87 dethroning of Miami in Game 5. “Everybody did their job defensively, offensively. We did it together, and that was the whole key this season.” Parker missed his first 10 shots on Sunday, but closed out the game and Miami by making seven of his final eight attempts. Diaw impacted the clincher just as he had throughout the series, grabbing nine rebounds and dishing six assists, while playing a season-high 38 minutes. To be one of these Spurs is to sacrifice the self for the team, to give over getting. Diaw wouldn’t have it any other way. And it finally paid off. In fact, the Suns defeated the Heat by 28 points in 2007.